Updated at 9:11 p.m. on Monday, July 30, 2018 with more information. Investment: TVA spent more than $4 billion. Haney was the top bidder in November 2016 to buy Bellefonte and its site for $111 million. The sale is to be completed by November 2018. Economic impact: University of Alabama estimates the plant would have an economic impact of $12.6 billion over time. Bellefonte would employ thousands of workers during its construction and directly employ 1,040 workers at the plant with an average annual pay of $136,000 and support another 3,136 indirect jobs with an average pay of $52,000 a year. Building contractors: SNC Lavalin of Montreal, Canada, which has negotiated agreements with nearly two dozen engineering, design and construction companies to complete Bellefonte. As a young adult fishing on Guntersville Lake in Northeast Alabama, U.S. Rep. Mo Brooks, R-Ala., recalls the thousands of workers employed building the Bellefonte Nuclear Power Plant and its giant twin cooling towers that tower over the lakefront skyline. Most of those workers left when construction was halted three decades ago when the Tennessee Valley Authority determined it no longer needed the extra power that Bellefonte could produce. After a series of starts and stops and more than $4 billion of investment, TVA ultimately gave up two years ago on one of America's biggest unfinished construction projects. "Those cooling towers have become a landmark in this area of the country, and every time you see it you think of the billions and billions of dollars that have been spent getting this facility to where it is and yet there has not been a single watt of electricity generated," Brooks lamented Monday while visiting the unfinished nuclear plant. But Brooks and other Alabama officials are hopeful that may soon change, thanks to a private sector effort to buy and revive Bellefonte with the aid of federal assistance and loan guarantees. If successful, local officials said, Bellefonte could reshape the economy of Jackson County and give a boost to the entire tri-state region, including Chattanooga, by adding thousands of new jobs. Staff Photo by Dan Henry / The Chattanooga Times Free Press- 11/14/16. Franklin Haney, representing his company Nuclear Development, LLC., speaks briefly about his winning bid to purchase Tennessee Valley Authority's Bellefonte Nuclear Power Plant in Hollywood, Alabama, on Monday, November 14, 2016. Nuclear Development, LLC., won the auction with a bid of $111,000,000.00 entering them into a contract to purchase the currently non-operational power plant. The purchasers stated in a press release that the project is expected to require an additional investment of up to $13-billion to complete and will create over 3,000 temporary construction jobs and an estimated 2,000 full time jobs when fully operational. "I'm not going to say that we've overcome every hurdle, but in my judgment we've cleared most of them and the few that remain look like we can overcome [them]," Brooks said Monday during a presentation to local industry and political leaders gathered at the Bellefonte plant. Former Chattanooga developer Franklin L. Haney, whose Nuclear Development LLC emerged two years ago as the top bidder to buy the shuttered nuclear plant, has assembled a consortium of nuclear engineering and construction firms to finish the Bellefonte units in another five or six years. In documents outlining his plans, Haney said he has unnamed parties interested in buying the entire electricity output of the Unit 1 reactor at Bellefonte and is looking for buyers of power from the second reactor at the plant. Aided by more than $2 billion in production tax credits for new nuclear generation allocated for Bellefonte and the prospect of $5 billion or more in federal loan guarantees for the project, Haney claims he should be able to finish the reactors at a cost allowing him to deliver power as much as $500 million a year cheaper for electricity users. "For many years, I have been committed to the Tennessee Valley, having invested billions of dollars in a region that continues to outpace the rest of the country in terms of job creation and economic growth," Haney said in a statement Monday. "I'm excited to announce that the finest team of nuclear engineers will take over the project and bring Bellefonte to a long-awaited completion." Although TVA once projected it would cost at least $8 billion to finish Bellefonte, a Canadian contractor hired to oversee the revival of Bellefonte thinks the Unit 1 reactor at Bellefonte could be finished for about $3 billion and a second reactor completed a couple of years later. The total cost of completing Bellefonte is projected to be only about half of what is projected for a similar size plant in Georgia. SNC Lavalin is working with Haney to oversee completion of the twin-reactor plant . The company insists it has a proven track record of successfully completing new power plants on four continents, as well as nuclear plant life extension projects in Canada, South Korea and Argentina. "We are very bullish on Bellefonte because it is a lot different from the other new reactors like those at Plant Vogtle (being built near Waynesboro, Georgia) or V.C. 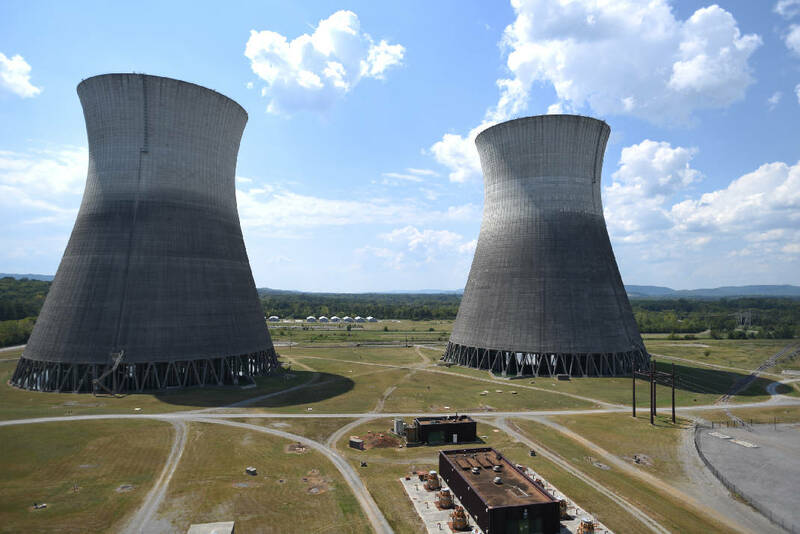 Summer (dropped by two South Carolina utilities near Jenkinsville, South Carolina)," said Preston Swafford, the chief nuclear oficer of SNC-Lavalin and previously chief nuclear officer at TVA. "We're not talking about building a new plant from the ground up. One of the reactors here was once 95 percent done, and fuel was even on site here, so we're confident it can be finished using proven designs and approved technologies." Swafford and former TVA chief operating officer Bill McCollum, another consultant working on reviving Bellefonte, expressed confidence in the plant while speaking beneath a banner proclaiming "Bellefonte a Reality." The banner included 22 engineering, design and construction firms in the industry that have pledged to work on the project — most of them on a fixed-cost basis to ensure that the plant is completed on time and on budget. "Only about 20 percent of this project is new work," Swafford said, noting that Bellefonte's projected completion cost is far below the projected $20 billion or more cost for Plant Vogtle. Because few new nuclear plants are being built and the number of operating reactors in the United States has dropped in the past five years, nuclear power contractors are eager for the business and offering better prices, McCollum said. But anti-nuclear groups have questioned both the need and expense of finishing Bellefonte, noting that previous projections about timing and costs have far understated the actual results. TVA began gutting key components of the Bellefonte reactors more than a decade ago when the agency first decided to abandon the original Bellefonte units in favor of next generation nuclear power. TVA later reversed that decision, but then ultimately gave up on any of its plans for Bellefonte as demand for more electricity has stagnated in the Tennessee Valley. Critics of the Bellefonte plant contend the integrity of the plant safety systems was jeopardized when steam generators and other equipment were removed for scrap metal from the plant. "I'm not sure that it is going to be safe and they can show the necessary quality assurance documentation after all that has been done at this plant," said Garry Morgan, a leader in the Bellefonte Efficiency and Sustainability Team that has long opposed the completion of Bellefonte as a nuclear plant. "We've heard these great claims so many times before and they have never panned out." TVA purchased replacement steam generators and developed plans to finish the plant, but later determined it would not need Bellefonte's power output anytime in the foreseeable future. For his part, Haney has applied to the U.S. Department of Energy for federal loan guarantees, which are still under review by DOE, according to Haney consultant and former Congressman Bud Cramer. Haney has yet to complete the $111 million purchase of the former TVA plant, although he did make a $22 million down payment in November 2016. In April, Haney reportedly met with the former personal attorney for President Trump, Michael Cohen, on Haney's yacht in Florida to discuss the possibility of recruiting investors from the Qatari sovereign fund. Haney, who was introduced at Monday's event by industry leaders, did not speak and declined to talk with reporters. But local officials who have met with Haney said they are optimistic that the long-shuttered Bellefonte plant may be revived and potentially could generate power by 2025 — 50 years after TVA began building the facility. "This is the biggest project in the history of Alabama and it would have a huge impact on Jackson County and the entire tri-state region," said Rick Roden, president of the Greater Jackson County Chamber of Commerce, which is backing Haney's efforts. Already, Roden said, the potential of finishing Bellefonte and Google's data center at TVA's former Widows Creek Fossil Plant up the road have attracted 12 retailers interested in locating in the area and "many new inquiries and plans for more housing" in Northeast Alabama.